Having secure locks on your home, business, and vehicle is the most important way to protect your property. 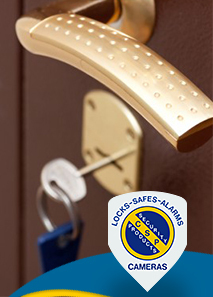 Colorado Security Products specializes in lock repair and replacement in Denver and throughout the Metro Area. Locked out? Need lock repair in Denver? Need lock rekeying of a compromised deadbolt? No problem! Our skilled locksmiths are available to come to your home or business 24/7. You may be able to schedule a lock replacement or repair, but if you find yourself locked out of your house or car, you need immediate, no hassle service. Our experienced technicians will be the spot within record time. When you move into a new house, changing the locks is an important security measure. Previous homeowners, their neighbors and relatives, realtors, and others may have duplicates keys that access your property. Our friendly locksmiths will come out with the proper tools and a variety of hardware for lock replacement in Denver that is aesthetically pleasing in finishes like antique brass, nickel and polished chrome. We can supply new hardware or lock rekeying for all major lock brands and even the lesser-known brands. Your new locks will look great and make your home more secure than the “second-hand” locks you inherited when you bought it. We even do key cutting to supply you with high quality keys you need for family members. When you have a business, break-ins are only one of your concerns. With employee theft accounting for 44% of retail loss, you want to prevent unauthorized key duplication that allows off-hours access by employees or others. At Colorado Security Products, we carry a line of ASSA and MIWA locks to improve security. The ASSA products have a key control system that allows only authorized signers to request keys. As Colorado’s only authorized MIWA lock provider, we can offer you a virtually un-pickable magnetic locking system! Easy to use and highly durable, MIWA locks are a clear choice for the security-conscious business owner. They are some of the industry’s finest and most reliable locks on the market today, and we are proud to offer this brand of high-quality, precision lock hardware. If you want to restrict access to areas of the building to certain employees, Colorado Security Products, Inc. can Master Key your business to keep office staff out of the warehouse and janitors out of the storeroom, while you can access all areas. If your staff changes or you lose a key, we can change the lock core and provide new keys. Lock rekeying is more cost effective than replacing all of the lock hardware. If you have ever locked your keys in the car, lost your keys, or broken off a key in the ignition, you know the value of an emergency auto locksmith. Car lock repair is tricky, as locks are delicate and easily damaged by the inexperienced. With today’s sophisticated automotive locks and security systems, you need a trained professional to do lock work. One wrong move can cost you hundreds! As expert locksmiths, we can help you get in your car quickly and without damage. Whether you have a foreign or domestic car, Colorado Security Products, Inc. can help you with your initial lockout, or with duplicating a lost or broken key. AAA member? Colorado Security Products, Inc. partners with AAA to provide you with the fastest, low-cost locksmith service available. If you are Plus member, you can enjoy free car lockout service, and up to $100.00 towards other covered car locksmith services, as well. If you are a Basic member, you will get $50.00 toward needed services. Contact us at (303) 756-1000 for lock repair and replacement in Denver and throughout the Metro Area.